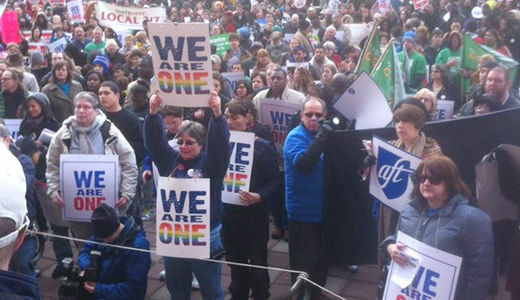 ORLANDO, Fla. (PAI) – Pride at Work, the AFL-CIO’s constituency group for gay, lesbian, transgender and bisexual workers, is blasting a top gay rights group’s endorsement of anti-union firms with a history of labor law-breaking – specifically Walmart. In a resolution passed at its convention in Orlando, Fla., August 29-30, Pride@Work singled out the Human Rights Campaign (HRC) by name, for the failures of its Corporate Equality Index. There are “systemic issues” with that list, Pride at Work says. Until the HRC addresses those issues, Pride at Work’s resolution adds, member unions should withhold financial support from the Human Rights Campaign. “Enough is enough!” declared Communications Workers official Shane Larson, Pride at Work’s co-president. The resolution explains that as the largest and most influential gay rights group in the U.S., the HRC “has a special responsibility to stand up and speak out for all members of the LGBT community.” The index doesn’t do that. The index, HRC says, identifies firms with strong protections and benefits for lesbian, gay, bisexual and transgender workers. But some of the firms routinely violate workers’ rights, Pride at Work says. It adds it tried negotiating with HRC staffers on the issue, but got nowhere. The big problem, the resolution says, is Walmart. But it’s not the only one. Walmart got a 90 percent pro-LGBT rating on the Corporate Equality Index, the resolution says, on recommendation of HRC’s corporate advisory council-a board with no worker or union representatives. That rating occurred despite Walmart’s record of constant labor law-breaking, discrimination against gays in the workplace, support of a discriminatory Arkansas law and denial of health benefits to the partner of a lesbian Walmart worker. The partner is suffering from ovarian cancer and the couple has run up thousands of dollars in medical bills. Of the top 20 firms in the Fortune 500 listed on HRC’s index, 14 got 100 percent scores – including the unionized Detroit 3 auto companies – and Verizon joined Walmart at 90. Verizon, though unionized, is demanding huge givebacks from its Communications Workers and IBEW members in contract talks. Phillips 66 Petroleum and Valero Energy got 15s, Berkshire Hathaway got a 0 and ExxonMobil got a -25. The index rated 366 enterprises. Pride at Work said it would continue to work to educate HRC about the necessity of including worker rights in its corporate evaluations. But until then, it adds, it wants its union allies to withhold funds from HRC.